Student Manual (pdf file) and the use of avalanche transceiver, probe and shovel. New AIARE Fieldbook and personal items on the Equipment List. Our traditional Level 1 is best suited for those who want to be mobile in the backcountry. This course is most effectively taught in 3 full consecutive days, meeting the AIARE 24hr. requirement. It also meets guidelines established by the American Avalanche Association. Students must be able to travel in avalanche terrain. This can be done using skis, splitboard or snowboard with snowshoes (see prerequisites below). Please familiarize yourself with the following resources as they will help prepare you for the topics discussed in the course. An AIARE Level 1 Certificate will be awarded upon completion. The Student Manual will be provided. Schedule may vary due to conditions. 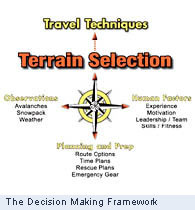 The main prerequisite is to be able to travel on the field portions of the course over snow through avalanche terrain and to be familar with your gear. The longest field exercise is about 5-6 hrs. stopping for field sessions and presentations along the way. These field sessions can be done by anyone in good to very good physical condition. You must have experience with backcountry skis or a splitboard/snowboard. Many students interested in getting into the backcountry logically want to begin their education with an avalanche course. It is possible to do it this way if necessary, if you have at least one full day of touring experience. Avalanche education is a long term process that best begins with basic prerequisite skills, then, after completion of the AIARE L1 course, continues with ongoing learning and gaining experience over time on the snow. These simple, one-day courses emphasize use of touring equipment, basic travel skills, hazard recognition and avoidance. One of these courses or equivalent experience is a recommended prerequisite to get the most educational value from a thorough ASI AIARE L1 Course.